Without Opponents, Combat Sure Wouldn't Be Much Fun! 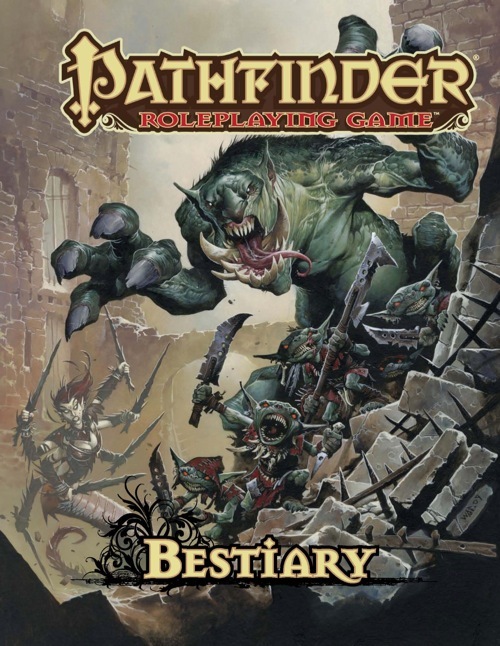 Bestiaries are Pathfinder's version of the D&D Monster Manuals: reference books containing descriptions and stat-blocks for hundreds of new creatures for PCs to battle, bother, or befriend. They're not designed to be read cover to cover, but that's exactly what I did for this review. The Bestiary weighs in at 327 pages and contains (according to the back-cover) over 350 different monsters arranged in alphabetical order. The book starts with a two-page Introduction, and it's actually worth reading because it explains what the (28!) different categories of information in a creature's stat block mean. It also introduces the the "Monster Icons" scheme, wherein each monster receives three different icons to visually denote its creature type, terrain, and climate. I like the idea of the icons, but I find them too small and similar to be useful, and I'm not interested in flipping back to page 5 too figure out what they mean. I'm happy just reading the corresponding entries in the stat block. For monsters, we start with Aasimar on page 7 and run through until Zombie on page 289. This is what the book is all about, but it's a challenging thing to review as my notes are full of bits of scattered remarks about dozens of different monsters. As I can't figure out a coherent way to synthesize them, I'm going to take the unusual tack of just including them as a sort of impressionistic picture of what's in the book. Skim to the bottom for more of the review. --aboleths are a lot tougher than CR might indicate! --Army Ant Swarms are pretty nasty! --cool how barghests become greater! --bebiliths: wow, awesome art for an awesome creature! --bugbear artwork is weird, but fascinating bit on "The Nature of Goblinoid Evil"
--don't argue with a balor demon! --great stories for demons--quasit familiars taking master's souls! --fantastic artwork all the way through! --Devourers are pretty nasty for their CR! --gelatinous cubes are really dangerous! --linnorms are nasty, especially curses and poison! --medusas, minotaurs, mimics--all the classics! --mummy rot sure is nasty! Hm, that was embarrassing. Sorry! After the monster entries are a series of appendices, and these definitely add value to the book. Appendix 1 is Monster Creation, and it offers a very thorough and clear guide to monster creation. There are a *lot* of moving parts to creating balanced monsters in Pathfinder, so this will take some time until you get the hang of it. Appendix 2 is Monster Advancement, and this is another important part of the book because it shows GMs how to adjust creatures in the book to make them more or less powerful by adding simple templates (like "Giant" or "Young") and by adding racial hit dice or class levels. Appendix 3 is the section of the book I use more than any other, and it's indispensable: Universal Monster Rules. In order to save space and avoid repetition in stat blocks, common monster abilities are fleshed out here: everything from Darkvision to Damage Reduction to Incorporeal and more. Only very, very experienced GMs should try to run creatures just from the stat blocks without remembering to double-check what their monster abilities do, precisely, in the Universal Monster Rules. The same appendix also contains creature Types and Subtypes, which are like packages of basic information that all creatures of a particular category, such as demons or animals, share. Again, this is to save space in stat blocks. Appendix 4 is very short, and provides some advice on Monsters as PCs. I've never used it. Appendix 5 is Monster Feats, though some PCs may actually legitimately use some of them like Craft Construct. If you notice that a monster has a feat you can't find in the Core Rulebook, that's probably because it's listed here. Appendices 6 and 7 list Monster Cohorts (for the Leadership feat) and Animal Companions (for druids and rangers), respectively. Appendices 8-12 are indexes that help a GM who is looking for monsters of a particular type, CR, terrain, etc. Really useful information that most people who just use online databases probably never realized was available. Finally, Appendix 14 contains Encounter Tables broken up by terrain. These include average CRs for an each table, but I still think it'd be foolish to actually roll on them: in a Hill/Mountain, region, for example, your PCs could run into CR 3 orcs or CR 12 fire giants. A party that is challenged by the former would be curb-stomped by the latter. Good random encounter table design needs to have a narrow range of CRs before they become feasible. I'm not a huge monster guy like some people, but I definitely enjoyed reading the Bestiary and I learned a lot about the core monsters of the setting. I know there are five later books that expand the selection far more, but much of what I see in APs and PFS still draws from this book. Along with the Core Rulebook, it's safe to say that the Bestiary was one of the releases that helped to solidify Paizo's reputation as a company that publishes the highest calibre of RPG books in terms of writing quality, artwork, design, and layout. It's not indispensable since there are multiple websites that present the same information, but for ease of use (and the joy of skimming), the Bestiary is one of those books that every GM should have. One only two books you require to jump in and play Pathfinder, it is the essential meat in the gaming stew. As important and the core rulebook is, it is nothing with out this work. Expanded and tweaked off the OGL 3.x material, its cleaner, better organized and tweaked for the Pathfinder rules. Every hero needs a foe, every damsel in distress needs a captor, and every GM needs a source of badies to keep the group on their toes. You will find it all here, between these pages is years of destruction and mayhem. No matter if you playing Pathfinders own setting, one of your own design and creation, or another publishers material, this is the must have companion to your CRB. The standard by which all monster products will be judged by. By now, there are several Bestiaries out in print, but when this book first came out you arguably needed to own it to play the Pathfinder Roleplaying Game. Was it worth the purchase? Decide for yourself! When we talk about a book's crunch, we're looking at its game rules, mechanics, and similar stats. As a monster book, the Bestiary is 99% crunch, and for Paizo's first real Bestiary, it is absolutely fantastic. There isn't a whole lot you can really say about monster stat blocks; they work perfectly and there aren't any monsters that feel ridiculous for their challenge rating (CR). The book also includes several new races that are appropriate for player characters; in this book, we have aasimars, the tieflings, and drow, as well as the applicable but seldom appropriate deurgar, drow noble, and svirfneblin. The book stays true to the rules of its predecessors; when you look at a drow, you recognize it as a drow from previous games. Because of the significant power up that the core races received these classically "OP" races aren't very far out of line with your traditional player characrers, and as a result we don't see the Level Adjustment system in Pathfinder. If you're unfamiliar with the term, in older editions of Dungeons and Dragons, some races were deemed so powerful that you had to actually forgo class levels in order to be a member of the race. For example, if you wanted to play a drow, you had a LA of +1, meaning that your race counted as 1 class level when determining your party's level. This either meant you were more powerful than your friends or (and more commonly) your GM had you start at a lower level to compensate. And believe me, it is not fun to be a sorcerer of an LA race because of how far behind your party is! The racial benefits seldom made up for the loss of character levels and it was a pretty terrible mechanic all around, so good riddance. Although the book's theme is classic monsters, Paizo manages to add its own spin on fantasy games by including weird and amazing monsters. A perfect example is the froghemoth, which is basically a giant aberrant frog-monster. As a huge Lovecraft fan, I was ecstatic to see monsters like the shoggoth creep up in Pathfinder as well. For a first Bestiary, the spread of monsters is well-chosen and you could definitely run a game with only this book if you really wanted to. What probably amounts to the best change of all, in my opinion, is the changes to the rules for building your own monsters. These rules are difficult to comprehend and enact in other games, but the Paizo team does an excellent job of laying out step-by-step every detail in crafting your own monsters by including handy charts and tables. For a game that knew it wasn't launching with much material and that it wanted to be backwards-compatible with older products, it was a very wise choice to streamline monster-making as much as they did and its probably the best reason to keep a copy of Bestiary I in your library alongside future monster tomes. 5 /5 Stars. When we talk about a product's flavor, we're talking about its fiction content, its style, and its overall feel. This section is always very opinionated, because even though I whole-heartily enjoy Lovecraft and his works, there are those who don't like their minds thrust into insanity and the mere sight of a shoggoth or whatnot. When you read the Bestiary, the one thing that becomes very clear is that there simply is not much room for flavor. Most monsters get a paragraph and a half of descriptive text and a beautiful picture, but that's about it. Honestly, however, that's all this product needs. The monsters that are detailed are classic monsters, so the information provided about them tends to be enough that classic gamers can recognize the creature for what it is and new players can get a sense of wonder and learn enough about the monster to be on the same page with the veterans. The art is fabulous in this book and supplements the descriptions perfectly, even when the monster concept is weird text-wise a beautiful illustration helps to sell it to you personally. The elephant in the room is that Pathfinder wants to have its own identity as much as it wants to follow in the footsteps of its predecessors. This means that every so often the Paizo team completely re-imagines and redefines the traits of a specific monster. Usually this happens to a relatively unknown or under used monster (we'll talk more about this in Bestiary III), but there is one monster in particular that is relatively well-known and got the Paizo makeover in a big way. That monster, which has become Paizo's mascot of sorts, is the goblin. To give a little bit of background, traditionally goblins have admittedly lacked character; they were little more than evil halflings in most settings. Paizo's very first adventure path, Rise of the Runelords, shook this up by drastically changing the image of the goblin; they were now psychotic savages who were obsessed with fire and scared of dogs and horses. They sang Children of the Corn style songs about death and murder and often filled a role as comic relief in many of the adventures they have been featured in while simultaneously managing to inspire fear and terror in many a party. In my experience, you either love or you hate the new look of goblins. Many classic gamers that I've played with deplore the "new" goblin if only for the art design; big heads, small bodies. Honestly, however, it doesn't bother me much; my gaming generation includes Warcraft's techno-suicidal goblins and Warhammer's hordes of insane, suicidal goblins; next to those, Paizo's take on the goblin fits in rather nicely. For being limited to several paragraphs of text per monster, the Bestiary gives you everything you'd expect and more flavor-wised. Its a book of monsters that feel threatening and believable; there's nothing too dumb or too far out there unless you're a hard-core medieval traditionalist. 5 /5 Stars. When we talk about a book's texture, we're talking about its grammar and layout, among other things. As someone who has actually sat down to try and write a bestiary, let's be clear that if there's one thing I get, its that stat blocks are HARD. They're hard to format, they're hard to standardize, they're even hard to spell check because of the sheer amount of text that a book like the Bestiary has. All of its complex jargon, half of it made of surreal naming conventions. With all this mind, if there's one place that the Bestiary is amazing, its the texture. There is almost no errors of any kind in this document. Perfect grammar. Perfect spelling conventions. Perfect formatting. Everything is perfect. As you can see in the picture I included, the Bestiary breaks from traditional monster books in that it limits one monster page, with only a few exceptions (mostly animals and familiars). There is extreme attention to detail in the text placement, and its very impressive that the book manages to be as descriptive as it is with as little space as it has; almost every monster is illustrated, after all, so not only are you juggling stat blocks, but you're also juggling them with text descriptions and illustrations. This book is a marvel of editing and layout and nothing less. 5 /5 Stars. This book does everything right. It is the shining star by which all monster-based products should be judged. For a first attempt, Paizo smashes their monster book out of the park, past all expectations. It makes me excited to start looking at the future Bestiary products. yes, oh glorious gods yes! YES!!! I hoping for this book since I saw the mock up for the World Book. Keep up the good stuff Paizo!!! So how are we going to get the PDF is there going to be a Pathfinder RPG subscription? So I guess it's too early to ask about any possible PF additions or about those that were cut from the 3.5 MM? Just ahead of the hardcover core PF RPG. Makes sense. They need to make sure the two are synched. That's two definite purchases for me. Not a bad price either considering it's the equivalent to the typical three core book D&D release. Noticed that too. I remember happily torturing my PCs original D&D characters with the updated / upgraded monsters from the MM. Boy did they whine. Heh. No problem like that with PF, given the beta. Damn it. but I guess we all knew that this was coming. Just a question of when! However, 250+ monsters... any idea who got left on the cutting floor, apart from copyrighted monsters and the Tojanida ? I've already asked my wife if I can bring this hot thing to bed. She said it "depends on the art". What we all want is "Flumphs Revisited" book written by Nic Logue. However, in the mean while, we want them in the PFRPG Bestiary. races to get a preorder into Shopping Cart.....Success!!! So cool, this comes true! I think I just died and went to ... well, whichever celestial body will take me. Please tell me that that the various templates will still be useful with this, they were one of the greatest ideas 3.5 came up with. Excellent - I am looking forward to it! Every time I prep an adventure I find it much more convenient to have all the adventure's stat blocks in a single printed document that I can flip through. To that end, will there be an associated PDF for this product, so that I can cut/paste the stat blocks into another document? That, or a PDF with only the stat blocks would make a nice PF-SRD reference! I second that, and I generally strongly prefer hard copies of books, but for the bestiary, I would love to have it available as a PDF too! It is most likely a place holder. The book doesn't come out for almost a year. A PDF will be available, and the cover is just a mock-up. Is the "Expected January 2009" a typo? This would mean it will have Pathfinder RPG game related material in it 8 months before the actual rules are released. You know, only one thing could make this cooler. If every single gribblie were to be illustrated by WAR. Of course, that's unpossible...but it'd be sooo cool. While I don't currently plan to ever play the PRPG rules themselves, I still must say that a new take on the core monsters, much like the "Revisited" book(s) would be awesome. I love new fluff and art that will make my players do a double take to figure out what exactly they are dealing with. I don't believe they'll have room in this book for complete CMR-style reimaginings of all the creatures. While James and Erik have both said that there will be more flavor in this book than there is in the 3.5 MM, it will still be limited to 1-2 pages per monster. They are continuing the Revisited series, however, with Dragons Revisited and Dungeon Denizens Revisited next spring. Paizo... i HATE you!i really HATE you! at least... do we get vampires, werewolves and ghost??? pretty please? hey I liked the Dracolich Cover! D'oh! No, it's still July. We'll fix the display. still therewould bevampries and werewolves? Are there new critters, or critters from the Pathfinder modules? Or is it all Pathfinderized-versions of standard critters? Any plans for teaser art over the next few months? I assume that the little nuances that are required since a few rule changes will be in this bestiary right? Things like what critters can be sneak-attacked by rogues and already figured up CMB's right? I am all in baby, just kind of was hoping now that it could be January. July makes more sense however. You need to get rules all finalized and so-forth. will there be a PDF available as well? Will it include the following sentence: "Your Pathfinder RPG Weighted Gelatinous Cube will never threaten to stab you, and in fact cannot speak?" A PDF will be available. There will probably be a way that certain people will be able to get that PDf for free along with their print edition, but specifics on that won't be determined for a while yet. Would that mean "select few" or "pre-ordered" or "subscribed to something or other"? Probably one of those three... as I said, specifics on that won't be determined for a while yet. Probably a few months. Does this need to be ordered separately or is it part of one of the subscription series?